This grilled tenderloin recipe is so easy and it is one of my daughter's most favorite foods. I buy a whole tenderloin and cut it into 1 1/2 inch steaks. Lay your steaks out on a plate and criss cross score each one with a steak knife-not deeply, just so the meat has a barely noticeable X pattern. This tenderizes the meat and helps the seasoning soak in. Then lightly drizzle on Worcestershire Sauce and Liquid Smoke-either flavor (you can get a bottle of this in the seasoning aisle at your supermarket). Then sprinkle the steaks with Lawry's seasoning salt (also in the grocery store seasoning aisle, it is a mixture of salt, sugar, paprika, turmeric, onion and garlic) and a light dusting of pepper. Take the back of a spoon and press the seasoning salt and sauces into the steak. Flip the steaks over and repeat the process. 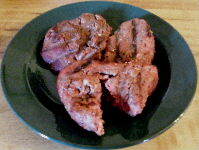 The steaks do not need to marinade in this mixture, they can be put on the grill right away. I start my steaks on a high heat to seal in the juices; cook about 3-5 minutes, then flip to seal the other side. Then turn it down and cook for another 5-10 minutes, depending on how well you like your steak done. Believe it or not, my daughter likes her steak in the rare to medium rare category, while others in the family like it medium to well done so you need to adjust the cooking time to your family's tastes.